Morton® Clean and Protect™ contains a patented formula that helps to clean and prevent buildup in your water softener, keeping your softener running smoothly over time. It also helps to prevent mineral buildup in pipes and appliances – helping to extend their life and improve efficiency. 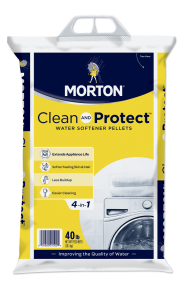 Morton® Clean and Protect™ Pellets keep your water softener running cleaner and longer. They are phosphate- free, and keep virtually all unwanted hardness minerals out of your water. 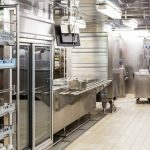 You can count on reduced costs associated with fouled resins, added maintenance, clean-outs, downtime, while extending the life of your appliances. Using Morton® Clean and Protect™ Pellets in your water softener will leave behind significantly less calcium and manganese insolubles in your brine tank than salt pellets. Morton® Clean and Protect™ Pellets contain a water-soluble resin cleaning agent. They also meet or exceed ANSI/AWWA B200 standard for sodium chloride.